Parents of children with autism, understandably, are always looking for a way to teach language to their afflicted child, and improve speech as much as possible since this is one of the core deficits in autism. Even children with Asperger’s syndrome suffer from speech that can sound somewhat stilted or robotic. Speech and Language Pathologists refer to the cadence of language as Prosody. 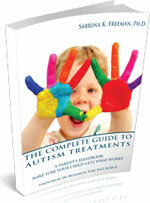 When working with children who have autism, the first goal is usually to teach the child to communicate. Behavioral programs are clearly the best way; however, the one area that is often ignored is problematic prosody, which seems to be a high priority deficit to eliminate. The impression I get is that people work so hard at getting our children to communicate in every manner possible, that we parents should simply be content that our children speak at all, and that we shouldn’t be concerned that when our kids open their mouths, it’s obvious they have a disability. Although I understand the sentiment, I’m a firm believer that we must give our children the best opportunity possible to reach their fullest potential, and that includes the best attainable prosody! Imagine your child going into a store and getting help from the salesperson without being stigmatized for poor prosody! Over the years, I’ve gone to countless autism related conferences and I’ve asked the same question: How do I improve my child’s prosody? I’ve never gotten a good answer. I’ve researched it myself and have not found any compelling research in this area. Meanwhile, the private sector keeps innovating, particularly in affordable computer technology. couple of years, on and off. I have observed, purely anecdotally, that a program designed to teach a second language may be improving her prosody. The question is, can this be true? If we can use “off-the-shelf” language programs and apply them to autism with some success, think of the potential! I think I may be seeing good results; however, without a controlled study, I’m not certain, from a scientific standpoint. Any graduate students out there looking for a thesis topic?